According to science there’s a direct correlation between your level of happiness and whether or not you’re currently on a rooftop in Los Angeles breathing in the cool evening air and as you gaze out over the twinkling city sprawl below you. Maybe we love rooftops because elevation gives us perspective on life, and watching the tiny people going about their business below us makes us realize how petty all our worries are and that we really just need to let it all go and stop resenting Nicole for borrowing that Boy Meets World box set and returning it with disk five so scratched up it won’t play. Or maybe we just love rooftops because looking at stuff from up high is dope. Regardless, we live in a city practically made for spending every weekend afternoon on a roof (immaculate weather, unbeatable sightlines, year-round poolside hangs—what more could you ask?). Here’s where to do just that. 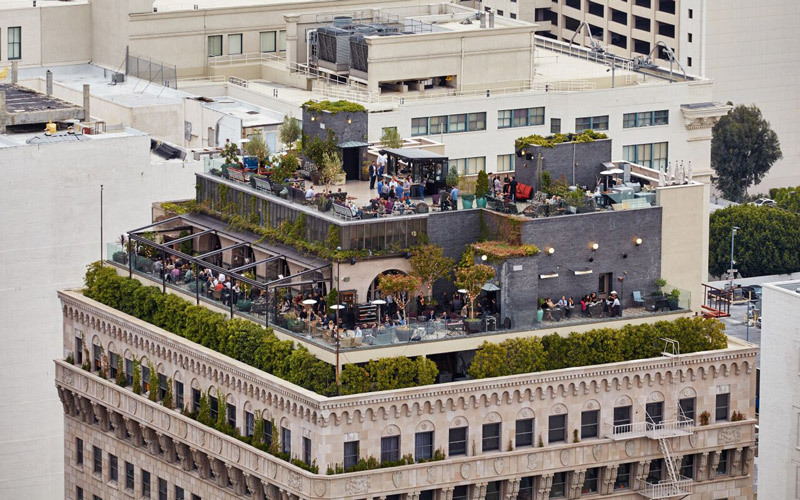 Perch is one of L.A.’s most iconic rooftops (as well a fabled brunch destination), and it lives up to the hype with a multi-tiered roof (level one: restaurant, live music in the evenings; level two: excellent bar, fireplaces) and views out over downtown. Plus you have to take not one but two elevators to get up there, which adds to the pomp and circumstance of the experience. If hanging around a bunch of abnormally attractive twentysomethings while drinking your way through a rotating list of inventive themed cocktails sounds like your speed, the Ace is a failsafe. Adorned with Gothic flourishes and bursts of bougainvillea, it overlooks Broadway and the red glow of the Jesus Saves sign. For all you urban sophisticates out there, this is the call-in-sick-and-spend-a-Thursday-afternoon-drinking-mojitos-poolside destination of choice. Perennially open to the public (unless there’s a private event), it still feels like something of a hidden gem. 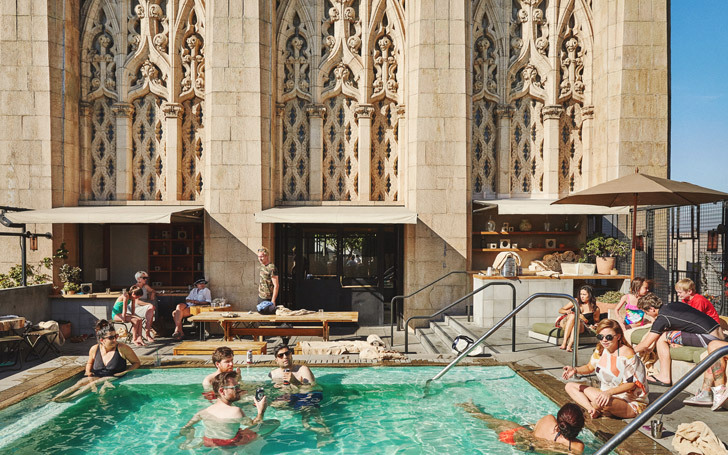 This yellow umbrella-studded rooftop makes for a surprisingly on-point lunch hangout, ideal for a little workweek escapism or a post-LACMA decompression (it’s right down the street from the museum). Yeah, so the Eastern Columbia Building is definitely closed to the public, but diving into the reflection of the neon-lit clock tower on a warm night is quite possibly the most surreally magical L.A. experience you can possibly have. Make friends there. Move there. Become Johnny Depp. Whatever it takes. What it lacks in distance from the ground (it’s just on the second floor), it makes up for in Roy Choi. 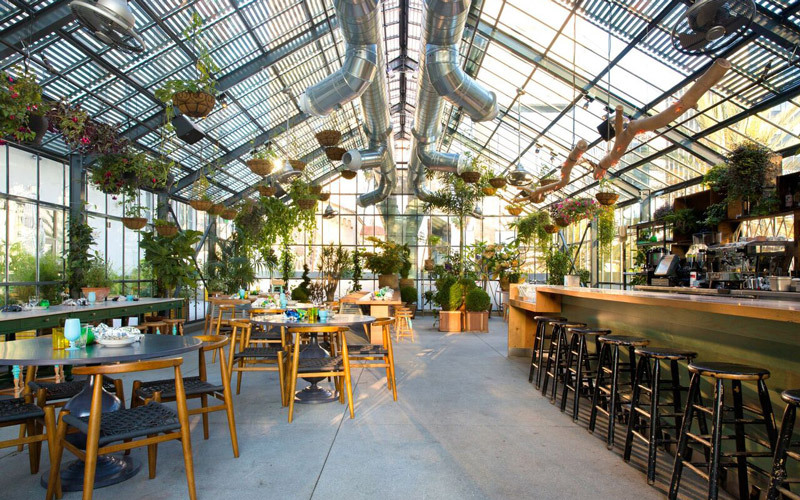 It’s also the only place where you can eat green curry eggplant inside of a greenhouse in Koreatown on a roof. The expansive rooftop bar overlooking the Hollywood Hills pretty much sets the standard for epic rooftop experiences, and it’s ideal for those nights when you need some spicy soft shell crab and an unspecified number of boba cocktails. This is it, guys. Peak views. This is the highest off the ground you can get in L.A. without access to, like, a helipad, and the $25 admission a small price for the ability to just come up and chill here for as long you want. Seriously, life is too frenetic, and sometimes you need to sit in silence 1,000 feet off the ground and lose yourself in the etherial glitter of the city lights at dusk. With ’70s styling and a caricatured German biergarten, the Standard is likely weirdest rooftop on this list. The DJ sets are funky as all get out, and there are classic films projected onto a blank wall of the Pegasus apartments across the street. Are those waterbed cabanas sanitary? Who knows! Are the views incredible? Absolutely. 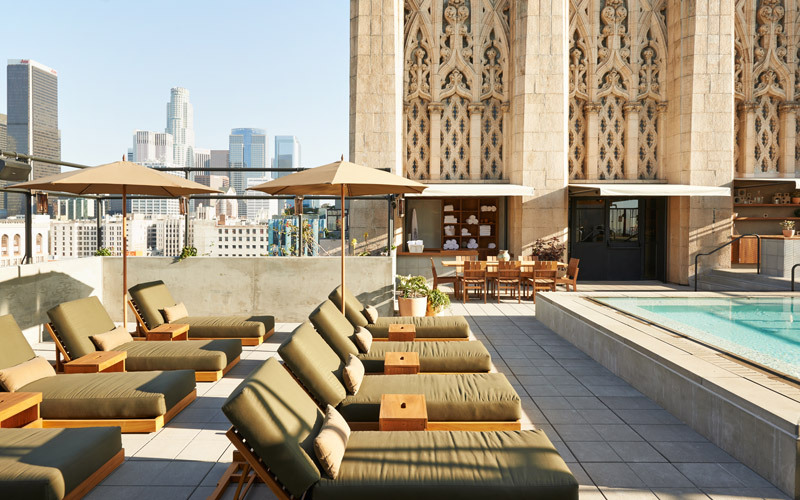 Colorful, youthful, and brand new (it just opened this past summer), this hotel rooftop is the ideal spot to bask in that golden hour light that’s so unique to L.A.—ideally over a pile of Korean fried chicken wings, but that’s up to you. Also there’s a yoga studio. So yeah, Skybar’s glory days are certainly behind it, but hey, this place is a true rooftop classic. You can can count on a lively atmosphere come nightfall when the party gets started in the otherworldly glow of the pool. Being on the ground in Venice beach is good. Being on a rooftop in Venice beach is great. You can do that at the Hotel Erwin while soaking up matchless ocean views from within the warmth radius of the nearest heat lamp. If you’re into sunsets, and sea breezes, feeling like you’re in heaven and such, you’ve come to the right place. Previous articleThe Most Instagrammed Restaurants in L.A.